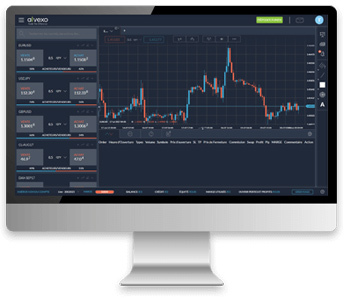 The web trading platform from Alvexo is a powerful, full-featured platform available to clients anywhere. Unless you’re a floor trader at a stock exchange, you use a trading platform to set and execute important trades. Sometimes this requires you to download heavy programs that may not work well with your computer, pressuring the use of one solution for all investing needs. The best brokers offer many ways to trade, including browser-based, or web platform trading. Web trading is available always and requires only an internet connection to use. In addition to the popular MT4 platform and mobile suite, traders with Alvexo have the freedom to operate in any manner they choose from a variety of trading platforms. By logging in to the web trader platform with your username and password, you have instant access to your account, full control of your funds and every tool required to trade at full capacity. Get analysis, news, charting and graphs, indicators, educational resources, trading signals and of course, the ability to execute flexibly all from your browser window – no downloads necessary. Alvexo’s online web trading platform has a simple interface that is designed to put the relevant information in easy reach, with positions immediately accessible and key data like tickers and news always visible. While having every piece of data in front of you is advantageous, the organized approach to our web trading platform aids in two of the most important qualities of successful trades, clarity and certainty. The input received in the design of the platform from our analysts showed that while all data is accessible, the pieces most influential to success are highlighted. Beginners and advanced web traders will be happy with the functionality and modernity of the experience, and the educational resources available through the platform enhance growth and understanding. The web trader’s ease of use puts it on the scale somewhere between mobile and the MT4, the simplest and the more complicated, respectively. However much a compromise the web trader is between heavy and light solutions, it doesn’t sacrifice functionality at all. Experts give these tips for those who prefer the web trader, and who want to make the most of it. Learning the interface is the most important investment you can make in your trade success rate, as knowing where the clutch information is when a short trade window opens can quickly make the difference between a good and a great position. By finding the most efficient way to navigate through the tools relevant to your strategy, you can inspire confidence in yourself and your trades. Trade on the web with Alvexo and get access to the industry standard for trade education, so you can quickly and fully learn nuanced trading strategies to employ on the go. Traders benefit the most from using Alvexo’s web trader platform, due to our cutting-edge technology and unique approach to interface design. Get the advantages of an expensive trading terminal and a quality education at the same time by using Alvexo’s web trading platform now.